The instrument is incomplete, with some parts modern. The chanter is known to be original, and the top joint of the bass drone known to be a reproduction. These images are based on full-size xerox originals, which are (unfortunately) the best quality images I have at hand. 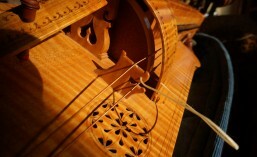 The pewter inlay is particularly spectacular on this instrument. The images have been scaled to fit on the page, but the files are actually at much higher resolution. They can be downloaded and viewed in any image editing program. These images are not displayed to scale on this page, but the source images should scale correctly. These are from my own working notes, with no guarantee regarding the information’s accuracy. I’ve included this information simply because it is not documented elsewhere, and it may be of value to others. If you have more to add, please comment. Fingerholes: Hole diameter from tracing, actual hole throat a bit smaller.